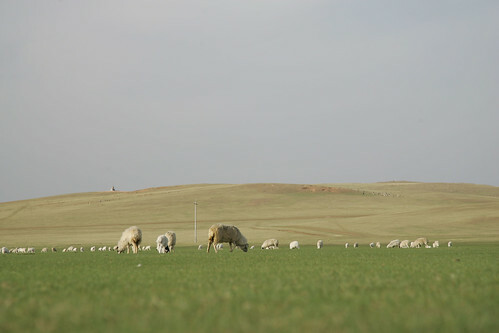 Sheep graze pasture in Inner Mongolia; a long-term research study shows that large-area grazing on steppes actually reduces, rather than increases, nitrous oxide emissions into the atmosphere (photo credit: ILRI/Stevie Mann). Five ecosystems-climate researchers, including Klaus Butterbach-Bahl, of the Karlsruhe Institute of Technology (KIT), have been honoured for outstanding interdisciplinary research on nitrous oxide emissions. Butterbach-Bahl is a bio-geo-chemist now working on joint appointment at the International Livestock Research Institute (ILRI), in Nairobi, Kenya, and the Institute of Meteorology and Climate Research, in Garmisch, Germany. Butterbach-Bahl is expert in measuring trace gas emissions from different land uses, particularly in determining greenhouse gas emissions from different manure and land-use management strategies and developing site-specific options for poor agricultural communities to use to mitigate climate change. The team was granted the 2013 Stifterverband Science Award—Erwin Schrödinger Prize in the amount of EUR50,000. With this award, the Stifterverband and Helmholtz Association recognize outstanding scientific achievements of researchers of various disciplines. A widely noted study by Butterbach-Bahl’s research team refuted the prevalent opinion that large-area grazing contributes to the constantly increasing nitrous oxide concentration in the atmosphere and, hence, to global warming. The new president of Stifterverband, Andreas Barner, bestowed the award at the Helmholtz Annual Meeting on 19 Sep 2013 in Berlin. The team’s study, ‘Grazing-induced reduction of natural nitrous oxide release from continental steppe’, was executed mainly by Butterbach-Bahl and geographer Michael Dannenmann, from the Atmospheric Environmental Research Division of KIT’s Institute of Meteorology and Climate Research (IMK-IFU), as well as by atmospheric physicist Xunhua Zheng, of the Chinese Academy of Sciences; chemist Nicolas Brüggemann, of the Forschungszentrum Jülich; and geo-ecologist Benjamin Wolf, of Empa/Zurich. While the project was carried out, Nicolas Brüggemann and Benjamin Wolf still worked at KIT. The findings obtained by combining ecosystems research with climate research were published in the journal Nature in 2010. The scientists proved that, contrary to previous assumptions, livestock production on steppes does not increase the release of the greenhouse gas nitrous oxide into the atmosphere, but, on the contrary, reduces it. Nitrous oxide (N2O), along with carbon dioxide (CO2) and methane, is among the gases contributing most to climate change and global warming. The greenhouse effect of a certain amount of N2O in the atmosphere exceeds that of the same amount of CO2 by a factor of about 300. About 60% of anthropogenic nitrous oxide emissions are produced by agriculture, e.g. when microbes in the soil decompose nitrogen-containing faeces of grazing sheep or cattle. Scientists consequently assumed that livestock breeding on steppes and prairies contributes to the constant increase of nitrous oxide concentration in the atmosphere. In their research project, funded by the German Research Foundation (DFG), the researchers proved that the situation is far more complex: Areas that are not used for livestock breeding actually release higher amounts of nitrous oxide over the year than areas on which animals are grazing. For their study, the scientists made measurements at several stations on the steppe of Inner Mongolia / China over one year. They found that previous short-term studies had simply ignored the fact that the release of considerable amounts of nitrous oxide from steppe soil into the atmosphere is a natural process and that most of this natural emission is caused by spring thawing. It is exactly this emission that is reduced considerably by grazing, as was shown by the five researchers in their study. Grazing animals reduce the height of the grass. As a result, the snow is carried away by the wind more easily. The thinner snow cover reduces insulation of the grazing areas in the long and cold winter. Hence, soils are colder by up to 10°C, Butterbach-Bahl explains. The scientific team assumes that previous calculations overestimated nitrous oxide emission from grazing areas by about 72%. Still, it is a fact that nitrous oxide concentration in the atmosphere is increasing constantly. To understand this, much more research work remains to be done, Butterbach-Bahl emphasizes. Intensified animal husbandry will not solve the problem, as large amounts of methane will be released. Moreover, overgrazing of steppes causes soil degradation and high losses of the soil’s carbon reserves. Since 1999, the Helmholtz Association and Stifterverband have been granting the Erwin Schrödinger Prize to recognize outstanding scientific achievements and technological innovations at the interface of various disciplines in medicine, natural sciences and engineering. Work must have been accomplished by representatives of at least two disciplines. The prize money is donated alternately by Stifterverband and the Helmholtz Association, and the prize is awarded annually. The prize winners can freely dispose of the money in the amount of EUR50,000. Every year, the prize is presented officially at the Helmholtz Annual Meeting. The Karlsruhe Institute of Technology (KIT) is a public corporation according to the legislation of the state of Baden-Württemberg. It fulfills the mission of a university and the mission of a national research center of the Helmholtz Association. Research activities focus on energy, the natural and built environment as well as on society and technology and cover the whole range extending from fundamental aspects to application. With about 9000 employees, including nearly 6000 staff members in the science and education sector, and 24000 students, KIT is one of the biggest research and education institutions in Europe. Work of KIT is based on the knowledge triangle of research, teaching, and innovation. Read the news release, Schrödinger Prize for work on nitrous oxide emissions, on the Karlsruhe Institute of Technology (KIT) website, 2 Jul 2013. Read about and view a recent slide presentation made by Klaus Butterbach-Bahl: Want ‘climate-smart’ farming adopted in Africa? Then better start collecting data on how much greenhouse gases African countries are emitting, at an ILRI ‘livestock live talk’ seminar, ILRI News Blog, 29 Aug 2013. Tags: German Research Foundation, Greenhouse gas emissions, Inner Mongolia, Karlsruhe Institute of Technology, Klaus Butterbach-Bahl, nitrous oxide, Stifterverband Science Award–Erwin Schrödinger Prize. Bookmark the permalink.